The A-26 (B-26) Invader was manufactured by the Douglas Aircraft Company, and production started in January 1941 in Long Beach, California. The Air Corps required a medium bomber which combined the characteristics of an attack bomber and a medium bomber and was fast, rugged, and dependable. Despite the excellent performance on its initial trial flight, the Air Corps insisted that the aircraft complete a thorough trial period. Once the plane was in production, there would be no other piston-engine medium bomber contracts signed. By June 1942, the heavy attack model A-26B was delivered, followed in September 1942, by the A-26A night fighter and in January 1944, by the A-26 bomber. The plane proved capable of handling every role it was assigned. As the A-26A night fighter, it was a great improvement over the A-20 Havoc. As the A-26B heavy attack bomber, it was more powerful and faster than the B-25 gunship. The A-26 bomber carried the same bomb load as either the B-25 Mitchell or the B-26 Marauder. The crew size was cut in half; while the speed was increased by 80 m.p.h. Range was increased over 500 miles. Douglas built just under 2,500 A-26s between 1943 and 1945, most being used against the Japanese during 1945. In Europe, the Invader attacked German supply columns on D-Day and helped to destroy retreating tank columns. During the Korean War, the A-26s’ capabilities were fully tested. The plane was reclassified as the B-26 and became the Air Force’s fiercest medium bomber. The B-26 was again returned to the Air Force inventory in the 1960s as a Counter-Insurgency (COIN) aircraft used by the Air Commandos of the Tactical Air Command. 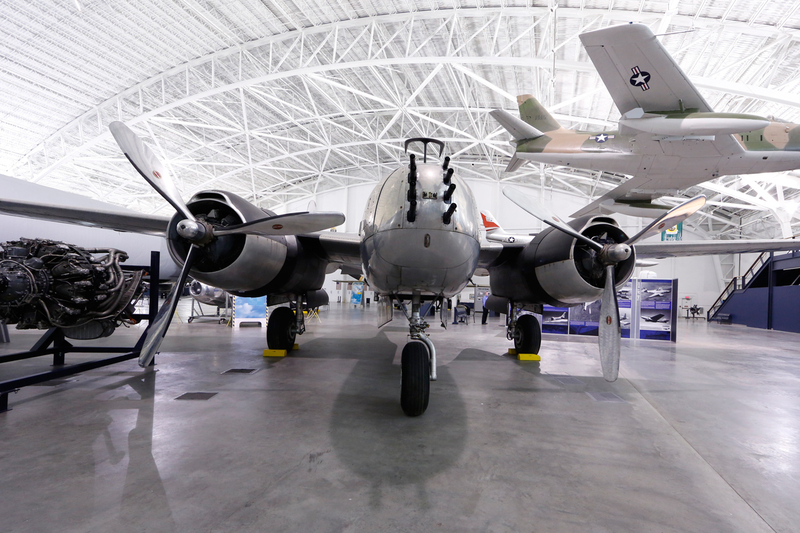 About our A-26B: Douglas built this A-26B in 1945 and delivered it to the U.S. Army Air Force on August 30. It was then removed from inventory and delivered to the Museum on November 24, 1969.